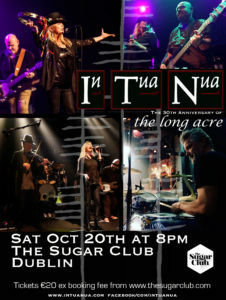 On Saturday October 20th, In Tua Nua are uniting to celebrate 30 years since the release of ‘The Long Acre’, the album that, along with with a slew of hit singles including ‘All I Wanted’, ‘Seven into the Sea’, ‘Somebody to Love’, and ‘Don’t Fear Me Now’, made In Tua Nua one of Ireland’s most iconic bands of the 1980s. Released on Virgin Records in 1988, ‘The Long Acre’ became a huge US college radio hit, remaining in the charts for six months and paving the way for a 28 date North American tour. By this point, the band were well established as one of Ireland’s premier live acts, having already supported Bob Dylan at Slane Castle and U2 on the European leg of their Joshua Tree Tour and going on to share the stage with, Fleetwood Mac, Simple Minds and Eurythmics, among many others. Since then, the band have reunited on various occasions, notably for a string of gigs in 2004, Electric Picnic 2012, and touring again in 2017 to celebrate the 30th anniversary of their time spent on the Joshua Tree Tour. When not playing together, the band members are still prolific in Irish music. Lead singer Leslie Dowdall has released two albums, claiming a smash hit with single ‘Wonderful Thing’. Drummer and singer Paul Byrne released his critically acclaimed ‘Cruel and Tender Ways’ in 2014, while also playing with The Drays, The Unelectables and The Guilty Party. When not playing, Paul also organises and curates the ‘A Night For’ concert series for Pieta House and Aware at the Olympia Theatre and The Howth Jazz and Blues Festival. The new live line-up includes Conn Woolridge on the fiddle, Sarge O’Hara on keys, Johnny Daly on guitar and Martin Nolan on uileann pipes. Audiences can expect to hear songs from ‘The Long Acre’ alongside some of the bands most well-known hits.